Ladies’ Day at Ascot today: and I don’t think I could say it better than I did the first time. Join me as we bawl ecstatically at Dover to move his bloomin’ a***. It comes around, every June, regular as clockwork, a chance to put on the heels, get on the train, have a few flute-glasses of Bolly as the horses hare around, and fall out of a posh frock. My husband’s Facebook update last Ascot said it all. In these posh parts we spend some time snorting with laughter at the expense of the little secretaries from Ewell and Guildford who pile off the train at Ascot station, warpaint applied and ready for their day-as-a-toff. 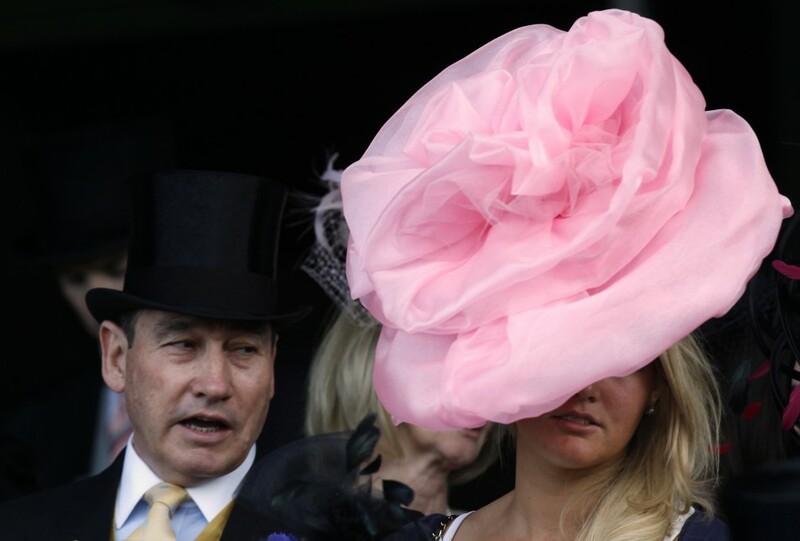 But the toffs are fewer and further between at the royal races than you might suppose. It all started well. Queen Anne, who did love to ride through her Windsor forests, was out one day when she came to a place called East Cote. She found a stretch on the open heathland which, she said, looked perfect “for horses to gallop at full stretch.”. That same year, on August 11th the first races were held. The royal connection ensured that this event has its enduring place not just in our sporting, but our social calendar. Royal Ascot is one of a handful of places where a showgirl can pick up a prince, the legend goes. We call women who seek out financial security by marriage gold diggers. But for centuries, that was the way it was done. In Jane Eyre, the governess marries the nobleman. In Pride and Prejudice, a clever middle class girl with a nightmare family bags one of the wealthiest landowners in society. But of course, they were very much middle class. I distinctly remember Thornfield’s housekeeper insisting Jane was the only person in the house who could supply refined conversation. The other servants didn’t figure. Working class: now that’s another matter. Terence Rattigan, that sublime understated playwright who brought us The Winslow Boy, had a knack of homing in on our deepest hopes and fears. Lawrence Olivier and Marylin Munroe take Rattigan’s story, ‘The Sleeping Prince’, and weave it tightly into the fabric of our modern folklore. It became The Prince and The Showgirl. Prince Regent Charles of Carpathia is among them, with his son the young King Nicolas. They are taken to see a show: and Charles falls for one of the performers, Elsie Marina. It appears to be love at first sight. Munro’s character enchants Charles and the queen mother not just with her beauty and ingenue, but also with people skills that help save a national incident. Do we secretly feel that these courteous people in their ivory towers need their gene pools stirring up a little? they can remedy this by marrying a commoner. Not a member of the merchant classes, but the salt of the earth at the bottom of the pile. Which is where Dover and his bloomin’ a*** come in. Clever George Bernard Shaw: to explore without resolution the relationship between the bottom and top echelons of society. Eliza, the flower girl from Covent Garden, is scooped up by Henry Higgins and equipped with all the skills to advance herself in the top social strata of society. Her appearance at Royal Ascot is iconic. She’s doing so well until she bawls at her horse, Dover, to move his behind, in no uncertain terms. The Ascot train today carries more than a gaggle of clerks and secretaries. It trundles along the tracks which lead from everyday life to privilege; from the monthly pay cheque to large inheritances. Even on the train, matchmaking- however fleeting- begins. At the close of Ladies’ Day today, most alight the train, their circumstances unchanged and, like Phil’s lady, a little the worse for wear. Perhaps Ascot is a little like buying a lottery ticket: perchance, to dream. ll the while, bawling at Dover to move his blooming a***. Posted in WhimsyTagged George Bernard Shaw, My Fair Lady, Royal Ascot, Terence Rattigan, The Winslow BoyBookmark the permalink. Quite. And today, Roger, it is pouring here. Bucketing down. Stilettos inches deep in mire. Eugh. “Where there is life there is wishful thinking” 🙂 You brought back memories of all those delightful characters. The lady is being squashed by a giant marshmellow – eek! Black Caviar from Australia is running this weekend at the Royal Ascot races – a once in a lifetime horse – won all of her 21 races so far! I think the fault was at my end – never mind – I said something along the lines of ‘if my children end up on the opposite side of the political fence as me I would be a bit upset 😉 ‘. The odds will be short for Caviar by the way! Have fun on the one way road system as you approach! Or are you able to avoid it. Passing through to somewhere else is not fun. Nope: went through on the train, Myfanwy, yesterday on the way to London. They all piled on late in the evening on our return. If someone has lit a match the entire carriage would have exploded due to alcohol fumes. Sounds like a lot of fun for observing from a discreet distance. Lou, you always see the best in people 🙂 I shall think of Browning whenever I see the little secretaries from now on! He is Kate – the odds will be awful but he is worth a punt. Oh, Kate, we use that irreverent line here often enough when someone is being a bit pokey. I can still remember when I first heard it out of the mouth of Audrey Hepburn as Eliza and laughed my own bloomin’ a*** off! ha! Dear Kate, those words “posh” and “toff” reached out to me today because of reading Penny’s recent posting on the word “posh” (portside out on the trip to India; starboard home). In Friko’s comment, she said that “posh” is sort of a put-down today in England. Here, too, I think. Toffs being posh! As your husband says so well, there must be a little within us that longs to be the working class dude who helps those poshes who don’t have the sense to solve their toffy problems. Or am I being a little daffy here????? Peace. We do like to mix the classes up, Dee, but they’re stubborn: they keep pinging back into place…. I went to the races at Ascot once, Kate, dressed to the nines, although very crumpled after a four hour journey in a compact minibus. The crumples weren’t that noticeable, though, after a fifteen minute trek across a muddy field in teeming rain. And I didn’t win anything after all that. Is she wearing a hat or a cake ? I am ashamed to admit I have a hat that is almost that preposterous. Definitely NOT posh. I have pictures of me in that hat up on the ‘net somewhere. Facebook, I think. I want to go to the Ascot and wear a hat! I wonder if I ever will…Do you think there are any filthy rich dukes willing to take me? Does that pink monster eat people? It certainly appears to be having its wearer for lunch. Oh, my hat! How ridiculous to wear something like that. Oh, my hat!! How ridiculous to wear such a thing. There was a rather alarming photo of Black Caviar in our local paper this morning, with veins popping, teeth bared, eyes bulging, mane flying. The grotesque abound at Ascot, it seems.